So long as you have eggs in the refrigerator, you can throw together a healthy dinner in the same amount of time you’d need to order takeout. You can top a pita with a baked (or fried) egg and some cheese (see recipe below) or add an egg to a bowl of rice, dressed salad greens, or cooked vegetables. These oft-forgotten all-stars come packed with key nutrients we all need: protein, healthy fats, and essential fatty acids. Toss a handful of hempseeds into the blender when making a smoothie, sprinkle chia seeds or flaxseeds on top of oatmeal, or swap sunflower or pumpkin seeds wherever you usually use nuts, like in this winter pesto, which tastes delicious spread on a sandwich or drizzled over roasted squash. Eating more real food doesn’t mean avoiding all packaged goods. While anything that comes in a sealed bag or a box is “processed” to some degree (the term simply refers to food that’s been changed from its original state), not all packaging automatically indicates a dietary no-no. Here’s what to look for. “If you feel overwhelmed by the transition to eating more real food, just start with breakfast,” says Lisa Leake, blogger at 100DaysofRealFood.com, who challenged herself and her family to avoid highly processed food and has never looked back. “Most of us eat the same thing in the morning, so changing this one meal can have a big impact.” Follow Leake’s lead and carve out time on Sundays to make a week’s worth of breakfasts, like these parfaits. Assemble the yogurt and fruit and store the parfaits in individual jars, one for each day of the week, in the refrigerator. Top with granola when you’re ready to eat. Make your life easier by preparing batches of foods you can combine into multiple meals. Start with a pot of grains or beans-or both-every week. “A pound of dried beans costs about $1. 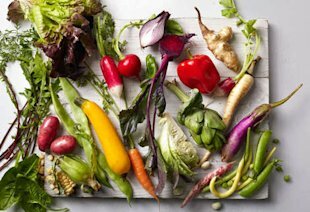 Once they’re cooked, it’s a snap to add them to any soup or salad,” says Mark Bittman, New York Times food columnist and author of VB6 and the forthcoming VB6 Cookbook. Apply this strategy to roasted vegetables (broccoli, butternut squash) and dressed hardier greens (kale, Swiss chard). “Don’t roast just two sweet potatoes; roast six,” he says. “The more you cook and have stuff around, the less you’ll depend on junk.” Start with these fridge-friendly staples. Kale In a large bowl, combine 2 stemmed, chopped bunches of Tuscan or lacinato kale (2 pounds), 1 Tbsp. olive oil, and the zest and juice of 1 lemon. Season with pepper and massage until softened, 5 minutes. When ready to eat, salt to taste. Makes about 10 cups. Sweet Potatoes Preheat oven to 400°. Prick 6 medium sweet potatoes with a fork. Transfer to a baking sheet and roast until tender, 45 to 60 minutes. Herb-Tahini Dressing In a food processor fitted with a metal blade, add ½ cup roughly chopped flat-leaf parsley, ½ cup tahini, 6 roughly chopped scallions, 2 cloves garlic, the zest and juice of 2 lemons, 2 Tbsp. apple cider vinegar, ½ tsp. salt, and ½ tsp. pepper and pulse to combine. With the motor running, add 1/3 cup olive oil in a thin stream until combined. Makes 1 cup. Farro In a medium pot, combine 3 cups water, 1 cup rinsed farro, and ¼ tsp. salt. Cover and bring to a boil, then reduce heat to low and simmer until tender, 35 to 40 minutes. Drain excess water. Makes 3 cups. Store each base in an airtight container in the refrigerator up to a week and reheat as needed. Why and how to avoid two major dietary saboteurs. White Flour The milling process strips the grains of most of their nutrition. The result: “White flour digests in your body rapidly, which makes blood sugar spike,” says Foodist author Rose. (Cue the almost inevitable crash.) “It should be a supplement to your diet, not the main event.” Try more-nutritious flours, like almond, coconut, and chickpea. One easy way to start: Substitute white whole wheat flour for 1/3 cup (or more) of the white flour in recipes. “Ancient varieties are super-nutrient-rich and offer long-lasting energy,” says Mollie Katzen, author of the cookbook The Heart of the Plate. And it doesn’t take much for quinoa, amaranth, and spelt to go beyond ho-hum: “Once you add sautéed garlic or scallions, they come to life.” These staples also add texture and heft when stirred into soups and stews and sprinkled on salad greens. Here are five ways to cook supergrains in less than 30 minutes. “You can totally build dessert into healthy eating,” says Ellie Krieger, host of the Food Network showHealthy Appetite. “If you say, ‘I’m never having it,’ you give all things sweet an enticing, forbidden-fruit aura. When you inevitably give in, it becomes a mindless munchfest.” Reach for better-for-you desserts like this clever chocolate pudding, made creamy by its secret ingredient: avocado.